The Philippine Information Agency (PIA) represented by Ms. Elizabeth Cuisia chairs the meeting on the National Council on Disability Affairs (NCDA) Sub-Committee on Advocacy whose members are mostly Information Officers of the national government agencies (NGAs) – Public Affairs Division, leaders of disabled people’s organizations and non-government organizations and the private sector. Discussions tackled the members’ programs and advocacy strategies relating to the 10 Goals of the Incheon Strategy to Make the Rights Real for Persons with Disability in Asia and Pacific, 2013-2022 and Inclusion and/or Full Participation of Persons with Disability in the Society. Further, the NCDA adoption/implementation in their own agency mandates. In the photo are (L-R) NCDA Acting Executive Director Carmen Reyes-Zubiaga, Kapisanan ng Mga Brodkasters sa Pilipinas (KBP)Executive Director Reynaldo Hulog, Autism Society Philippines (ASP) Mr. Rafael Torralba, Alyansa ng Maykapansanang Pinoy (AKAP-Pinoy) Mr. and Mrs. Oscar Taleon, Department of Transportation and Communications (DOTC) Ms. Victoria Paces-Apacible, Department of Health (DOH) Ms. Alegria Gabian and Department of Trade and Industry Director Thelma Dumpit-Murillo, Foundation on Communication Initiatives, (FOCI) Ms. Criselle Capistrano and Ms. Emily Abrera, Department of Social Welfare and Development Mr. Jaime Marino, Philippine News Agency (PNA) Ms. Leilani Junio, Information Communications and Telecommunications Office (ICTO) Madonna Estrelles. 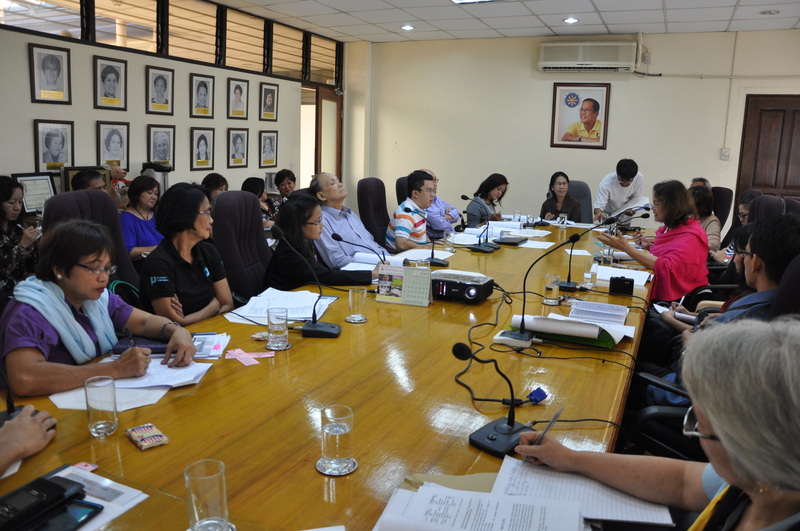 Other members include Department of Tourism (DOT), Director Evelyn Macayayong, Commission on Human Rights (CHR) Atty. Ronnie Rosero, Mr. Ranil Sorongon, ASP Consultant, Ms. Violeta Rojas of the New Vois Association, National Youth Commission (NYC), Mr. Patrick Umali, and Commission on Human Rights (CHR), Ms. Jessica Ragaza.